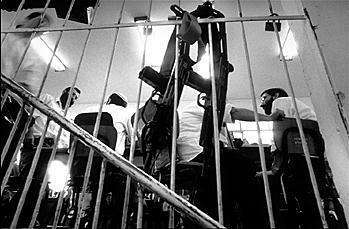 As the assassination of Israeli Prime Minister Yitzhak Rabin has shown, militant Jewish settlers in the West Bank present a formidable obstacle to the country's quest for peace with the Palestinians. While Hamas and other Arab terrorist groups wage war on the peace process from without, a group of extremist Jewish settlers, unmoved by their government's policies or public sentiment, are waging war within. Over the past two years I have been documenting the lives of these settlers. Passionately motivated by the ideology of Zionism, they view themselves as ordained by God and the Torah to reclaim ancient land, which they refer to not as the West Bank but by its biblical names: Judea and Sumaria. Yeshiva students here take self-defense as seriously as Torah studies. A simple trip to nearby baths or vineyards is an armed excursion. Mobile homes are crane-lifted into place in defiance of Israeli law. These settlers will not willingly move off the land and let their dream of a "greater" Israel be destroyed. 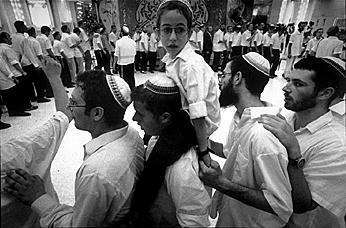 I started the project in 1994, documenting the daily lives of two communities: the militant Jewish enclave in the center of the Arab city of Hebron, and the small settlement of Bat Ayin, a lone hilltop community five miles from Bethlehem. I plan to return to the West Bank at least twice a year for the next few years to record the settlers' reactions as the West Bank is relinquished to the Palestinians. No matter where the peace process leads, the "true believers" of the West Bank will remain a community with a powerful story to be documented. This project also examines the broader question of identity. Like the Catholics and Protestants in Ireland, the Hutus and Tutsis in Rwanda, or the factions in Bosnia, the Jewish settlers define themselves by their enemies, or who they are not. Fear of extinction makes them prisoners of their own history. The settlers believe in having big families. Here, friends and relatives of a Hebron Yeshiva student dance at his wedding celebration. 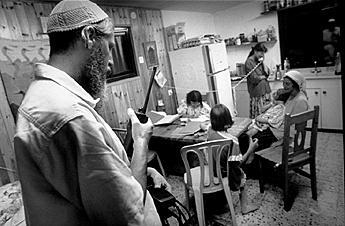 After prayers, the Anosh family in Bat Ayin sits down to dinner. Typically, this small community stays in radio and beeper contact with one another, out of fear of nighttime Arab attacks. Guns are never far away from the settlers, including these students at the Hebron Yeshiva, adjacent to the Cave of the Patriarchs. Ed Kashi is one of America's leading photojournalists. His work appears regularly in the National Geographic, Newsweek, the London Independent Magazine and other major magazines in the United States and Europe. His National Geographic cover story on the Kurds became a book, "When the Borders Bleed: The Struggle of the Kurds," published by Pantheon in 1994. Recent magazine spreads include a portrait of the African continent for Vanity Fair and one of California strawberry field workers for The Atlantic. Photojournalist Ed Kashi has covered stories for the National Geographic and other major magazines throughout the Middle East. He is the author of "When the Borders Bleed: The Struggle of the Kurds" (Pantheon).